Prices Canon compared with Nikon 500mm and 600mm telephoto lenses for sports and bird photography, but also useful for flowers high in rain forest trees (in Guatemala). 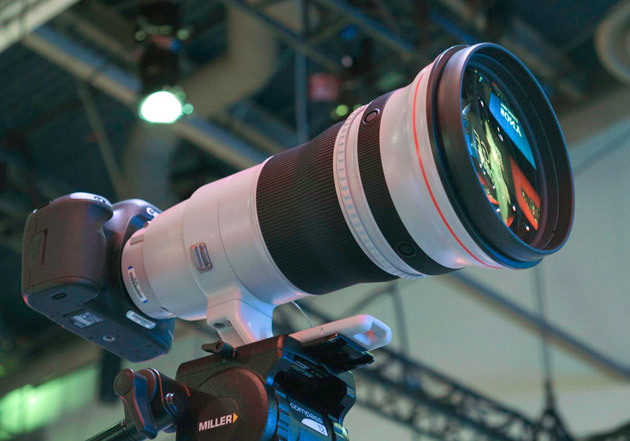 At CES 2013 trade show the lens which most attracted me was the Canon EF 800mm f/5.6L IS USM. This is because the only Canon lens category that I am lacking is a sophisticated telephoto. 400mm is not enough (and the 100-400 Canon zoom is the worst lens they offer still today). Their new EF 500mm f/4L IS II USM lens was several years delayed, so I never got one. 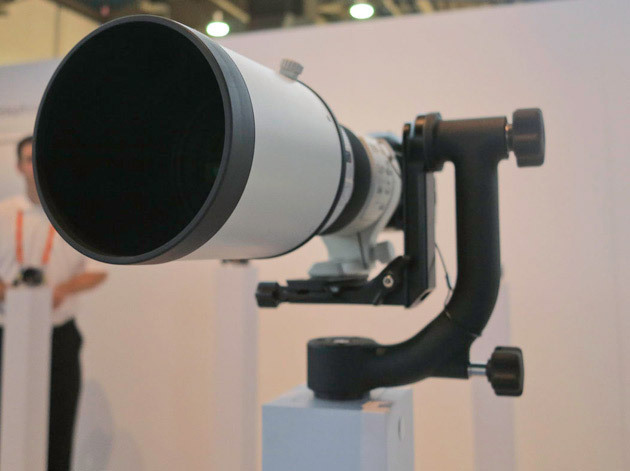 At Photokina 2012 I tested the EF 500mm f/4L IS II USM and found that I probably needed a 600mm. This is also available in a second generation iteration “II” (Canon EF 600mm f/4 L IS II USM). 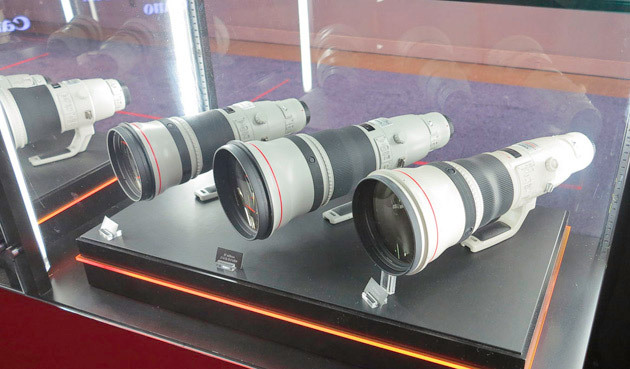 The older 600mm and 800mm lenses are still offered. But since I photograph a lot of flowers high in tree tops, an 800mm may be more of what I really need. Often the trees are in a gully, or otherwise not accessible, so in addition to the flowers being high above ground level, the tree itself is far away. The 800mm is not available in a “II” version, but the version which is available is precisely what our research institute could make good use of. Unfortunately the street price is a bit high, so we are waiting until funds are available from a donation or grant. Just realize these lenses are very heavy. 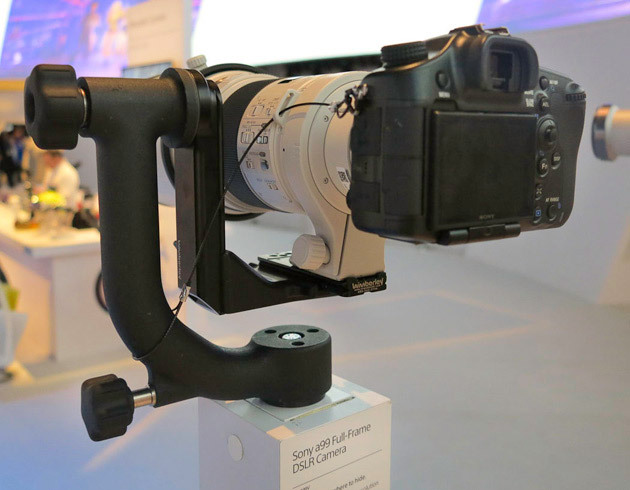 A tripod is advised and a Wimberley-like tripod head is recommended as well. Manfrotto now also makes a swivel tripod head, Bogen 3421 which is same as the Manfrotto 393 Long Lens head. 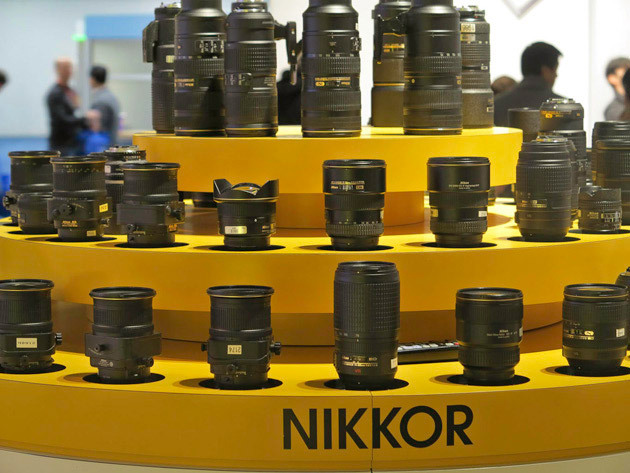 Original Canon and Nikon lenses tend to be better than after-market brands. Sigma lenses, however, are viable options if you simply do not have the money for a Canon original. However if you need performance and resolution, Canon and Nikon are considered higher quality. The EOS 1Ds Mark III camera body has clearly been replaced by the EOS-1D X. I am not yet convinced of the high ISO potential; On the 1Ds Mark III you see noise at much over 1000 ISO. Maybe the newer cameras have a significantly improved system? Digital Camera & Camcorner: Full Line Product Guide was booklet size where as EOS System, Fall 2012, was 8 1/2 by 11 inch size. Canon catalogs are ironically filled with pathetic photos (p. 9, a macro of a grasshopper: as a professor I would spend hours helping any beginner student who showed me such an inadequate image). The Canon editor should be flunked for having such a pathetic photo in a sales catalog. Fortunately other photos are awesome (the one of the raptor on p. 6 and reptile on p. 16). Canon publications included “Canon Live Learning 2013 Workshops, Up Close, Personal.” Just a list of workshops around USA, but shows at least they are active. As typical of Canon Inc, their Canon iPF printers were isolated, off on an edge of the camera booth. Only two wide-format printers were present; CES is definitely not a printer expo (I never saw Epson nor HP; if they were present, they were well hidden). Ironic that HP spent umpteen million trying to make a tablet to compete with Apple only a year or so ago: yet HP was totally non-present at CES 2013. 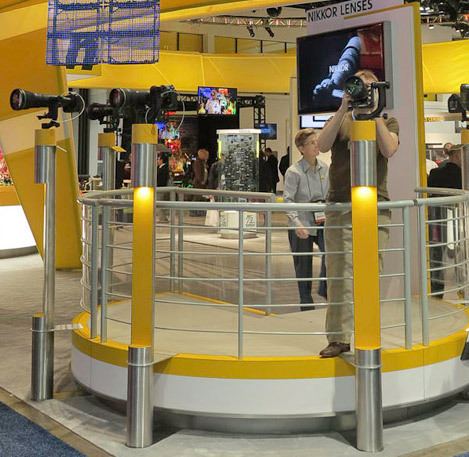 Although I have preferred Nikon for decades, I must admit that Canon had a more exciting and educational booth at CES 2013 than Nikon. Plus Canon had all their brochures available. Nikon had only one on D4 and one on the D600. No general catalog; no Nikon lens catalog. I have a Nikon D100, D200, and D300 (because the two Canon cameras of that era were not adequate). But then a Canon EOS 1Ds Mark III was provided by a Canon dealer, and this model was so much better than any Nikon that I switched to Canon. Nonetheless, I have many Nikon lenses from past cameras and have recently acquired a new 60mm Macro. Canon, on the other side, offers a wider range of lenses (such as 5x macro, Canon MP-E 65mm) and a wider range of flash accessories (such as ring flash). The one Nikon item which I lack is a telephoto, so I took a peek at these. Here again, the Canon booth had about 400% more space devoted to their telephoto lenses than the frankly rather wimpy looking space for telephoto lenses of Nikon. AF-S NIKKOR 500mm f/4G ED VR $ 8,398 These cost TWO THOUSAND less than the Canon 500mm. The models and prices for Nikon telephoto lenses are confusing, since the model names of the lenses on Nikon web site are not the same as the Nikon lenses on Amazon web site. Plus prices vary. The Sony booth is always worth visiting. But this year Sony had no catalogs whatsoever. To write comparative reports it is helpful to have hard-copy camera catalogs on my desk. 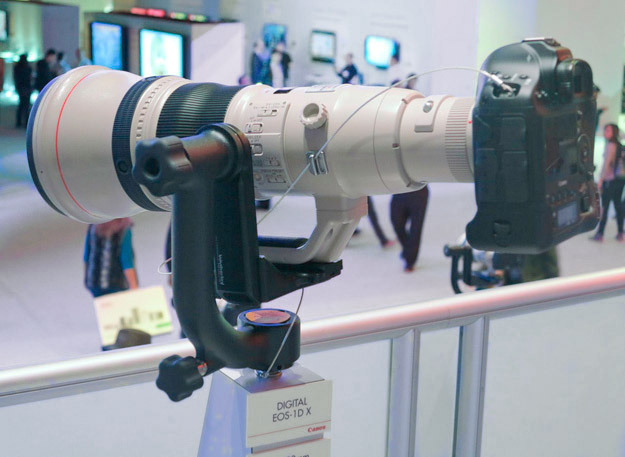 The Alpha a99 with a 500mm f/4.0 Super Telephoto Lens and a 1.4x teleconverter lens would be a system we could evaluate, both for birds and for tropical flowers high up in trees. 400mm is not enough, even with its 1.4x accessory. A 500mm would be better. However the official Sony web site says Temporarily out of stock. I missed the booth of Sigma this year. Last year their booth was off to one side of the exhibit area and therefore poorly attended. Since their claims of image resolution (with their three-layer sensor) could be construed as 300% exaggerated I tend not to accept their cameras. But a Sigma lens is the only after-market lens for a Canon or Nikon camera that I would even consider. But since most original Nikon and original Canon lenses are better, I tend to concentrate on the original lenses. The exception are kit lenses for Nikon (several models made in Thailand are cheap junk), and the 100-400 tele-zoom of Canon, which is flawed in about every way (and Canon admits they are fully aware of the flaws). 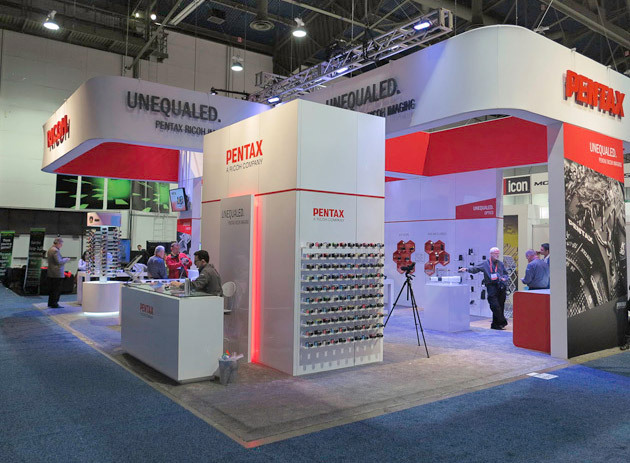 Pentax exhibited telephoto lenses for sports and bird photography. It is helpful that Ricoh bought Pentax. Pentax, and Minolta (whose remains were bought by Sony) were two fully acceptable brands. Since I am more familiar with Canon, Nikon, Leica, and Hasselblad, to evaluate Pentax telephoto lenses for sports and bird photography I would need to have one available from Pentax.